Erich Schiffmann told us that it took him 12 years to write his book, Yoga: The Spirit and Practice of Moving into Stillness. It took us only 10 hours to move into joy in Yellow Springs, Ohio. Erich’s book was one of the first yoga books I bought when I started my yoga journey and I had not looked at it for quite some time. His Moving Into Stillness workshop was this past weekend (his11th in Yellow Springs), so I pulled it off the closet shelf to remember to take it with me for his autograph. I wasn’t looking forward to a 6 hour ride to Ohio by myself so I thought reading some of it again would re-energize me for the trip — I ended up reading some excerpts to my class last week and I was right…I was rarin’ to go to Ohio and finally practice with Erich. I must say that after all these years of yoga-ing, I have never attended such a joy-filled yoga weekend, and that’s saying a lot. My long time readers know with whom and where I study yoga but this weekend was very different. I’ve been to many trainings that are heavy on technique and philosophy but there hasn’t been a lot of pure unadulterated joy. I recalled the trainings and sits I’ve done with Buddhist teachers and I can’t say there has been very much joy involved in those teachings either. While I am grateful for the buddhadharma in my life and it has liberated me more than I can explain, there is so much emphasis on suffering. Yes, I get it: life is suffering, pain is optional. In Buddhist meditation retreats, there is usually a lot of crying in the small discussion groups that one is always a part of — those tears are those of fear and grief and pain. I’ve never heard the word “joy” uttered in those situations and I almost feel guilty for embodying joy. But as for this weekend, it has been a very long time since I cried soul tears of joy in a yoga class — unless it’s my own solo practice at home. Erich’s classes consisted of: him talking, meditation, a guided asana practice, a free form (“freedom style”) asana practice set to cool music (everyone from Alicia Keys to Pattabhi Jois chanting OM SHANTI), then savasana or more meditation, your choice. Choice!…instead of rules and “shoulds” and enough technicalities to choke a sacred cow. Erich studied with both Iyengar and Desikachar and said that over time he morphed into his “freedom style” yoga. I loved that because the same has happened with me over the years for my own personal practice. I told Erich that I think I channeled him without ever having practiced with him or watching a video. Erich said that at first he did not know how to teach Freedom Style in classes, that when he asked people to do their own thing they were stuck and didn’t know how to do something that felt so natural to him. That was my first blown away moment during the weekend because as I later told Erich, the same thing happened to me. Once in a workshop I invited people (who were not beginners) to do their own yoga and everyone stood there and stared at me. Erich does not throw out alignment rules but he believes that where your yoga training should culminate is where you flower into YOUR OWN YOGA. All the techniques and rules of yoga should lead you to YOUR YOGA. He compared learning yoga to learning music. Just like a beginning musician learns the rules of music and the notes and then creates their own song, so should we learn the notes of yoga to create our own practice. Make your yoga as simple as possible but that is easier said than done. Don’t decide in advance what you THINK you’re supposed to do. Listen inwardly for what to do and then dare to do what your most inner impulses tell you to do in yoga. Your practice should open you up to a willingness to trust yourself and to the realization that the Totality — the “Big Mind” as opposed to our “Small Mind” — is us. This is similar to what Mark Whitwell (another student of Desikachar — any wonder why I naturally connect with certain teachers?) speaks about, Yoga as the connection to the Nurturing Source, the Infinite. In yoga we learn to settle into ourselves in order to let go of our conditioning and to become the REAL YOU. We should dare to give expression to what is bubbling up inside us and again, this involves letting go of our biases and conditioning. Erich emphasized again and again how we should think less and listen more. I recalled how I was chastised here for telling people to “shut up and do your practice.” That’s just another way of saying “Silent mind it”, as Erich calls it. Pause, ask God, Jesus, Buddha, or whomever your favorite Awakened One is for guidance, and then listen. Our deepest impulses, our intuition, our gut feelings…all of those are our connection with the Big Mind, the Totality, the Nurturing Source, the Infinite. Meditating is like clearing the mist or cleaning a foggy mirror, but we need to be clear that we indeed want a clearer perspective. Because if we have an unclear perspective it will be harder to interpret things as they come into our consciousness and we will respond to life inappropriately. I loved it when Erich told us to just take moments each day to be still, to sit, to silent mind it. You don’t have to sit in lotus to think less and listen more. Stop the chatter, stop the analyzing. Just stop and engage in the old-fashioned advice of taking a minute to smell the roses. I thought about all the people I see who are walking in nature and playing with their smart phones. STOP! I was struck at the age range of the students — I would say most were 40+, even 50+, and I thought that the students who need to hear this yoga wisdom were the 20 and 30 somethings starting out in yoga. Erich’s guided asana practice was not what some would call “advanced” with fancy pretzel poses. The emphasis was on working the spine and hips and I think the only standing pose we did was triangle. The difference was that the poses were repeated with various changes, going deeper each time. Just the way I like it, wringing it out. It was in the free style practice where I blossomed. Erich played three or four songs and it was our own practice. Some sat, some took savasana, and I have no idea what those closest to me were doing, my intuition guided my movements. It was the perfect combination of movement and music that caused the soul tears of joy to flow. It has been a very long time that someone else’s class affected me like that: I was free to be me. When I sat after the practice my body literally vibrated from crown chakra to my feet, each day I felt like one huge glowing ball of prana. Interestingly enough, I developed a bad headache and nausea the first day which I attributed to experiencing a tremendous detox. I needed that practice. “I will do what You have me do.” In other words: THY WILL BE DONE…because THY will is OUR will when we listen deeply. I have studied with excellent technical teachers and those who can recite yoga philosophy chapter and verse, but there are few who touch the heart and the core of your Consciousness, the precious few who leave you weeping those soul tears of joy. Sounds like he and Mark are cosmic twins with all of that Your Yoga talk. Which is wonderful! Love this: yoga is not some type of “exotic P.E.” Right! But I think that’s the mindset a lot of students begin with. They don’t know yoga as anything else, except stretching and trying to get a workout. Just yesterday I saw a tweet from someone talking about feeling “sore” and “broken” from their weekend yoga class. I didn’t reply but I thought, wow, really? Personally I come away from the classes I attend and teach feeling energised, awakened and as though I’ve learned something new about myself. Such a different perspective, no? In my own practice, and in the classes I teach I always ask people to sit – at least for a few moments – and focus on finding the stillness in their breath. And when in savasana, I ask people to try to resist moving for a few minutes and stay in the room with their mind, body and breath. So I loved what you reported about Erich talking about stillness. My home practice usually looks nothing like a “yoga class” practice – I do what my body feels it needs, which might be a handful of asana or a lot more. They are in whatever order works for me. His book is one of my favs.. it’s really down to Earth and not lofty at all. But it has a depth that shines through that, it’s a gem. Lucky you for having the chance to practice with him, he seems so at ease and magical. I attended Erich’s retreat this weekend as well; my first ever. I was apprehensive because I have fallen out of my yoga practice because of the philosophy and emphasis put on poses by most teachers I have found. Erich struck my core. He made me realize that what I’ve always considered yoga, but was told otherwise, is actually yoga! Your post eloquently described exactly how I felt. I couldn’t have said it better myself. The vibration emanating out from that gymnasium will be reverberating throughout the Universe for quite some time. Thank you for writing that, sister. Linda – THANK YOU for writing this down! I’m laughing because of what Erich talked about “I’ll write that down in the morning” piece! Clearly whenever you got this onto paper – you got ALL of it, and I’m SO grateful. I’m going to save it to my EverNote, and I’ve shared it on FB – only because people keep asking me what is so ‘wonderful’ about Erich. You nailed it! One of your other comments mentioned the pain folks often experience following other workshops. I, too, have had that happen – and I refuse to do it again! 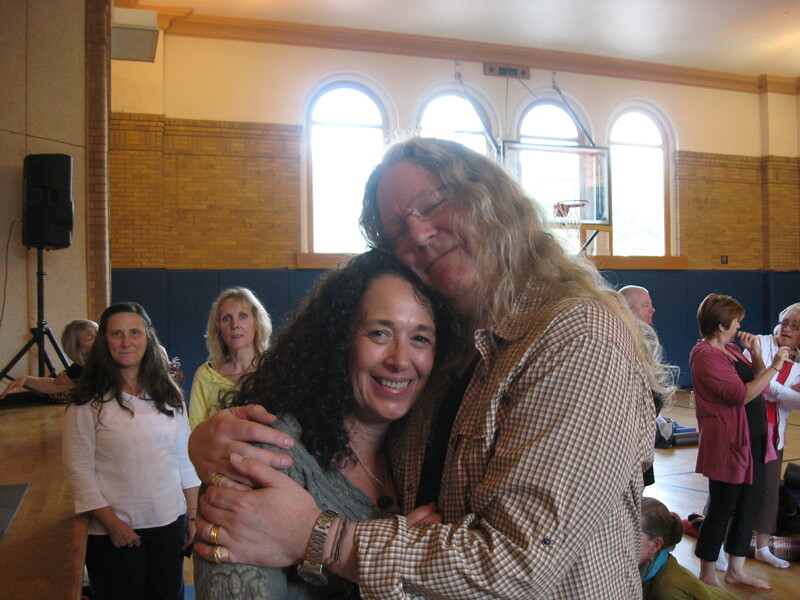 Thanks to Erich, my practice has ‘morphed’ into MY YOGA and I don’t have to have pain – we can choose to experience JOY! Hugs to you my Sister! I guess I count as one of those “young” yogis you mentioned, and I’m so happy I’ve connected with Erich. I agree with you, though. I think that his students are older because while he has been in the biz forever, his presence is so understated compared to the flashy, athletic stuff that YJ and other newer, younger celebriyogis are selling to the masses. I think what he’s teaching is so right on and feels so good, but at the same time it’s pretty radical, you know? Thanks for sharing. I would love the opportunity to study someday with Eric; it was his DVD that really sparked my interest in pursusing yoga as more than a physical practice (my first experience with yoga was via a Kathy Smith DVD!). This post was timely too, as I’ve been frustrated lately with the more challenging poses and wondering why the heck do I have to do them, are they so important?, when all I want to do is sit quietly. think you need to get me up there, Grace! any yoga studios there? I could spend a week doing classes in vinyasa krama, yin, meditation, and Erich Yoga! In the meantime, check out this site for studio listings and teachers. Thank you ,sister, for posting this reflection on a bliss-filled weekend. I was there too, my 5th ride with Erich in YSO, and I am glad I got released from the hospital to experience this joy. if our paths cross again we should talk! Just got around to reading this. Years ago, at a teacher training (Integral Hatha Yoga) we were asked to listen to the music and move our bodies accordingly. The music was changed every 3 – 5 minutes. It was the most powerful experience I have ever had in a yoga training. At a Vedic Thai Yoga training, I was encouraged to take 108 ujayi breaths every day. It is the most challenging practice I have ever done, even though it lasts less than 20 minutes. So many things to think about in this practice. The breath must be steady. The body must move to wherever it wants to go without the mind forcing something because the mind is busy counting breaths! And you have to give up those poses that take a long time to get into or that shorten your breath. You realize that those postures take time away from the important ones. Ooh, I know what practice I’m doing tomorrow morning! It’s been a few months since I’ve done this. Thanks for the reminder to be FREE! so funny! in my most recent research on inspiring yogis i came upon mark whitwells you tube videos (i’ll have to add him to my wish list of yogis i must meet someday) which led me to your website. i love your honesty and openness and your willingness to share with the community. i have also begun my yoga journey late,54,and can’t tell you how much my yoga world has expanded. many of your articles totally resonate with me this one about erich schiffmann for sure. i read his book during my teacher training here in milwaukee and thought he was brilliant. he is also on my wish list! anyway, i will continue to read your inspiring blog.